Home » Articles » Geeking Out » Geeking Out – Constructicons… Combine! Geeking Out – Constructicons… Combine! 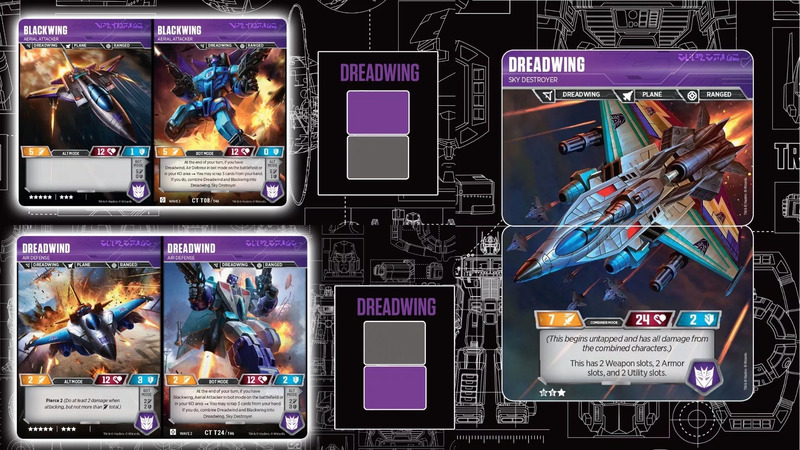 So, you want to know all about the Transformers deck? 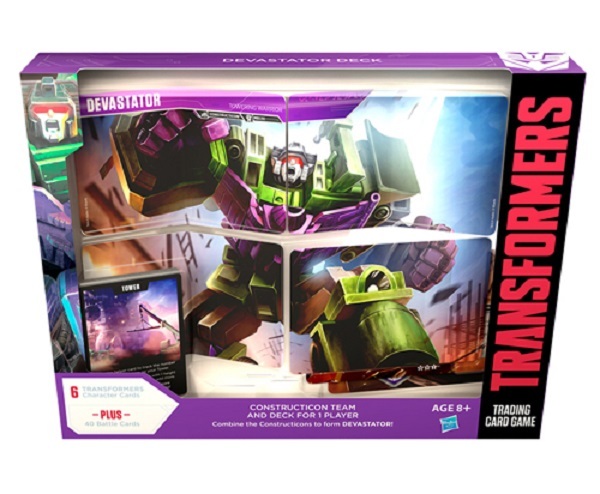 A brand-new Devastator deck, king of the combiners, the killer Constructicon himself? You’re not demanding or anything, are you? 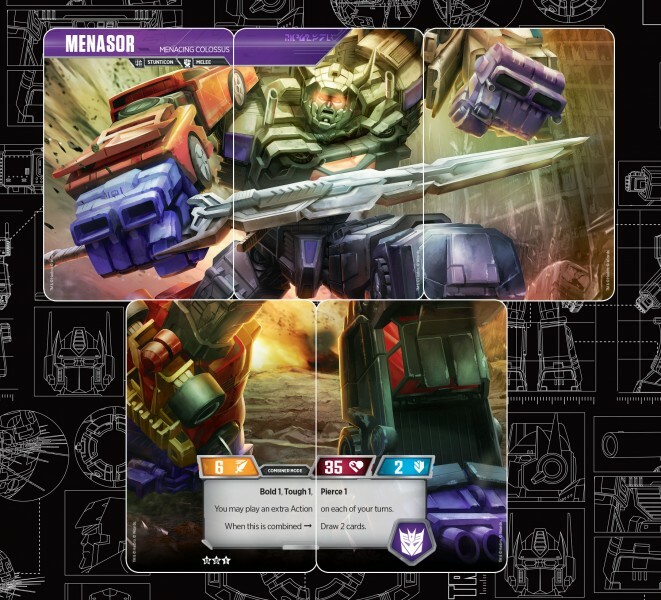 Yes, those fine folks at Hasbro have sent us a Devastator deck to look at, and we thought we’d also share some thoughts on the changing meta of Wave 2 generally now that we’ve had a couple of weeks to wade through it. It’s a great looking package, first and foremost. I like the way it’s transparent back and front, so you can see some of the bot/alt modes as well as the combiner in front. I’m less keen on cards being pre-folded; yes, it’s snazzy how they catch the light, but I’d still rather not have the chance of the cards buckling. I also like the fact that the Enigma is front and centre, making it clear that, yes, you get the cards you need to run the mechanic fully, and here is a green dot – if you’ve not encountered them before, be aware that this is not a starter deck but rather, slightly more complex. But that being said, it’s actually completely accessible, with an updated mini-rulebook included also. Let’s have a proper look at the battle deck then. This is clearly thought out as much for the established player as the novice, packing 3 of each of Grenade Launcher (still the stand-out weapon from Wave 1), Force Field (ditto for armour) and Pep Talks (Wave 2’s optimal draw engine). So this is a deck builder’s dream, as you’re already set for core cards you always want more of. Equally, this is great for the new player, because you’re straight in with the spine of pretty much any deck, and not resorting to the second-hand market to build something viable. To test the deck, my eldest decreed I take him on with our Tank deck, a pretty solid wave 1 deck (Megatron [c], Darkmount, Demolisher) that’s had some wave 2 juice (Superior Plating, Pep Talk). It’s a fairly nasty one, tends to have the edge over Autobot cars or Metroplex, and probably the most tuned. The boy started building the Constructicon tower, the additional mechanic by which Devastator powers up (with what he describes as “the beautiful art in the entire game”), letting a couple of the cheap cons get KO’d in the process. Nevertheless, he quickly got the Constructicons assembled, and we started to slug it out. The game went down to the wire but just survived with 1 health left to take down Megatron. We then decided to dial things up a notch, with the young pup taking the pre-constructed Metroplex deck against his big brother (still running the pre-Constructicons). Again, this was really close; again, Devastator just nudged to the win. It’s interesting that the two out-of-the box “advanced” starters are so well-matched, and makes for a really strong gameplay experience. 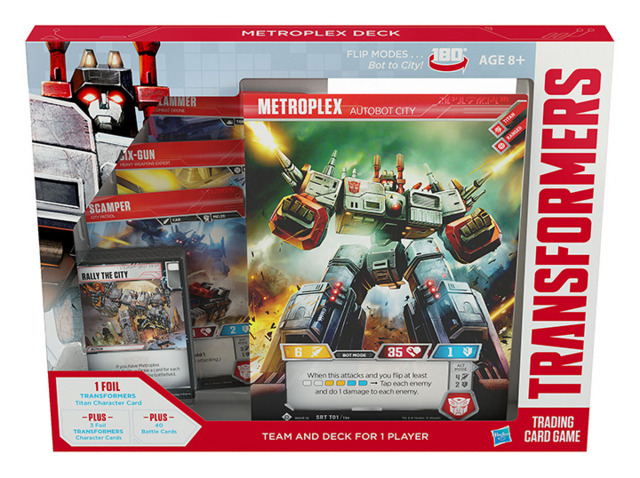 With very little tuning, both decks have enormous potential (Metroplex having shown its potential in the US tournament scene recently). Overall, then, it’s a really solid starter; whether it holds up against really heavy metal is another matter, and one that’s already dividing community opinion. Speaking of the wider game, now that we’ve had a chance to see how the W2 bots stack up (as it were) we thought we’d have a little look at some of the stand-outs. The Combiners are obviously what everyone’s interested in, and they seem to be… ok. Menasor, with additional action economy, and Predaking, with the potential to stack up multiple upgrades, seems to be the clear favourites at the moment, although Dreadwing’s lack of reliance on an enigma – or more than 2 bots – is going great guns, especially with the like of other Seekers such as Thrust. Perhaps surprisingly, the Combiner getting the least love is Volcanicus – this Wave, the big-ticket Rares seem to be the least desirable. That being said, Super-Rare Transformer (SRT) Starscream is this set’s Nemesis Prime, the SRT that’s going to dominate the competitive meta. If I’m being honest I’m a little disappointed that we again have potential SRT dominance, although I’m not overly surprised as it is so often the way with TCGs. However, the flip (or should that be alt?) side of this is that we’re not seeing the Rares being quite as must-have this set, as mentioned. And the winner of our Omega Supreme giveaway is… Greig Fraser! Get in touch (EMAIL) to dominate the battlefield!